So I was at SM North Edsa in Quezon City, and decided to check Comic Alley (even though they sell the same stuff and has limited Anime Merchandises now) I stumbled upon a Sailor Moon gashapon, but was empty ;A; but! 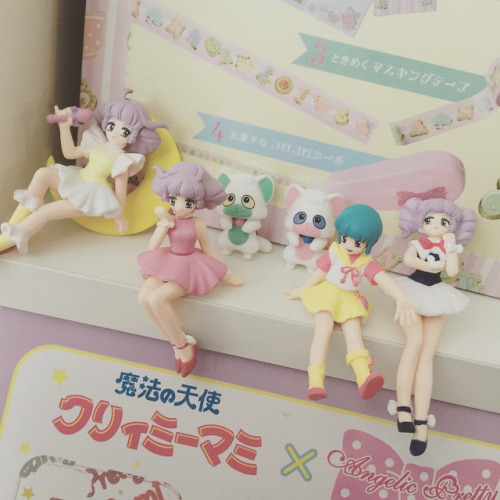 Creamy Mami was there to save me! The image at the top was taken from Tumblr, and those are the kawaii surprises you'd get in this version of Gashapon machine! So I was hoping to get Mami in her idol form or the kawaii waitress one... was super nervous but! I was super happy that I got the one I wanted! This is the cover on the machine, I want them all actually lol! The machine needs 3 Tokens, and each token is for 60 php, so that's a total of 180 php... it's a bit pricey but super worth it because the size isn't as small as keychains in other gashapon machines lol Overall I really love it and the quality is super nice as well, it's not that hard to attach her legs to her body, and it doesn't come off easily! So! Drop by this Comic Alley branch if you also want Mami's magical gashapon collectible!